The arrest of Julian Assange was hardly unexpected, scholars told Sputnik, lambasting the Ecuadorian government and its American and British backers for violation of international law and an attack on the freedom of speech. "The arrest of Julian Assange is hardly unexpected given the rumours that have been circulating for some weeks", said David William Norris, a British political commentator and writer. Andy Vermaut, a Belgian human rights activist, echoed Norris: "It had been known for a week that something was coming", the activist noted. "Julian Assange has announced it himself. Julian Assange knew perfectly what would happen, because this was published on WikiLeaks itself". On 25 March, WikiLeaks tweeted that a corruption investigation was launched in Ecuador against the country's president, Lenin Moreno, following the release of the so-called INA Papers casting a shadow on the president's financial activities. The organization added that "Moreno tried to sell Assange to the US for debt relief". The Ecuadorian government dismissed the assumptions and accused Julian Assange, Venezuelan President Maduro, and former Ecuadorian President Correa of plotting against the Moreno government. Quito also claimed that Assange was involved in the publication of the INA Papers, which the latter denied. On 2 April, Moreno stated that Assange had "violated the conditions of his asylum" and later deprived him of asylum-seeker status and handed him over to Britain. However, according to Kintto Lucas, writer, journalist, and former deputy foreign minister of Ecuador (2010-2012), Moreno's move is in direct contradiction to international law. "The extradition of Julian Assange by the Ecuadorian government to the UK authorities and, possibly, his extradition to the United States not only violates the Geneva Convention, which makes it quite clear that you cannot extradite a person who is politically persecuted and granted asylum in Ecuador, but also demonstrates the actions of the government trying to satisfy all requests [from the] US", Lucas emphasised. On 11 April, the US Department of Justice (DoJ) announced charges against Assange, accusing him of conspiring with Chelsea Manning to commit "computer intrusion for agreeing to break a password to a classified US government computer". The DoJ document highlighted that Britain is "pursuant to the US/UK Extradition Treaty". The WikiLeaks founder could face up to five years in a US prison if found guilty. Public Enemy Number One: So Will Julian Assange Be Extradited to the US? "Due to WikiLeaks' exposures on alleged US war crimes in the Iraq and Afghanistan wars, the US has been after the extradition of Assange since 2010", Professor Marcello Ferrada de Noli, chairman of the NGO Swedish Doctors for Human Rights (SWEDHR) presumed. The professor pointed out that in contrast to former Ecuadorian President Rafael Correa, who granted Assange political asylum due to the risk of his extradition to the US, "President Moreno had another stance on issues of Ecuador's national sovereignty — read, relationships with the US government, which openly consider South America as 'our backyard'". Professor Stuart Rees, director of The Sydney Peace Foundation, an Australian academic, human rights activist and author, agrees that Moreno's move does not have anything to do with the law, but rather is part of Washington's broader "culture of revenge": "The Americans do not like anybody exposing their murderous behaviour in wars. And WikiLeaks and Julian Assange, of course, have managed to do that. So this is about the 'culture of revenge'", the author stressed. Commenting on Quito's "change of heart", British political commentator Norris remarked: "It was perhaps not the best place for him to have run, seeing that Latin American politics are so unstable and a change of government unfavourable to his case would eventually appear". "The coming of Moreno to power spelled the end for Assange", he underscored. The scholars drew attention to the fact that by the time Assange found himself in the Ecuadorian Embassy in London on 19 June 2012, he had not been officially accused of any criminal activities. "Let's began by clarifying that Julian Assange has never been charged with any crime, neither in Sweden nor elsewhere", Professor Noli highlighted. "After the publication of WikiLeaks of over 70,000 classified documents covering the war in Afghanistan, the US urged nations participating in the US-led coalition in Afghanistan to initiate prosecution against Julian Assange". According to the professor, "of the countries consulted, only Sweden complied with the US request and subsequently they opened an investigation against Assange on alleged sexual offences to permit a warrant for his arrest". 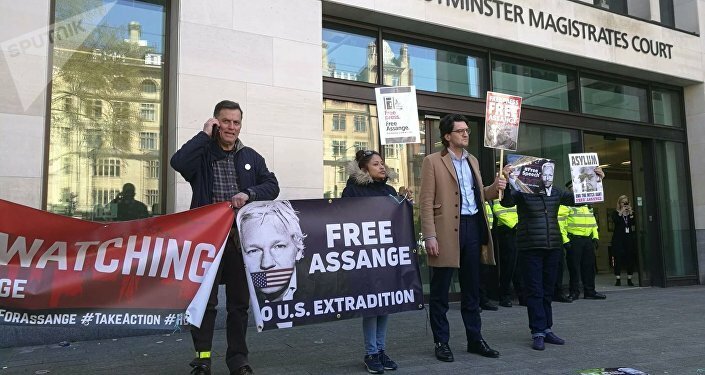 "The real reason for the arrest was, according to open investigations SWEDHR has access to, the extradition of Assange to the US. A sealed process against Assange has been opened in Virginia, and recently this has been confirmed by the US Department of Justice", Noli suggested. Eventually, Sweden dropped the investigations into Assange, he noted, adding that for its part, the UK stated that it would arrest Assange anyway in case he leaves the embassy's premises. To justify its decision, London outlined that the WikiLeaks founder had broken his bail conditions in Britain. According to Professor Rees, in this case the UK has yet again demonstrated its "own version of justice". "Breaking bail conditions is not such a serious offence", Rees highlighted. "Look, at the moment he is being charged as I understand it with not respecting and breaking his bail conditions", the professor said. "I mean, I have got years of experience in London courts, even though I live in Australia. I mean that could be a day's imprisonment, it could be a week's imprisonment, or a judge could say that this guy has already been confined for seven years, he can go, we will waive this condition". Again, it's not about justice, the scholars say, calling Assange's persecution by the US and its allies nothing more or less than a politically-motivated campaign. "So really if it were not for these politically motivated charges against him related to his activities as a journalist and as a facilitator of some of the world's most important whistle-blowers, including Chelsea Manning, who is now back in jail, none of this would be an issue", Asa Winstanley, a London-based investigative journalist, underscored. "It is just a trumped up charge — failure to appear for this. It is a completely politicised charge. He should not be extradited". 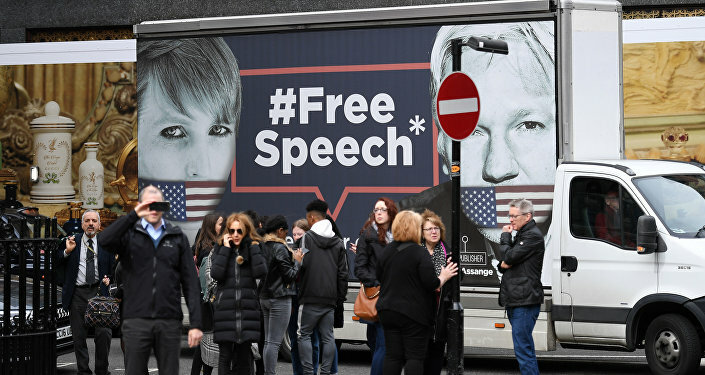 The Assange precedent is an alarming signal for those standing up for freedom of speech and press, the scholars warn. "Freedom of expression is at the stake, everywhere in Europe and the United States. That is the fate of human rights activists in this world", Vermaut stressed. "Authenticity to be truthful, to remain true to principles, is very often not rewarded in this world. It is therefore a black day for freedom of expression. The man who added the deed to the word will now pay the ultimate price for his courage and determination. Everywhere in the world you feel the resistance to this arrest". For his part, Piers Robinson, chairman of the politics, society and political journalism department at the University of Sheffield, recalled that "we've been here before when black leaders such as Nelson Mandela in South Africa or Steve Biko who was arrested and then murdered". "On the one hand it will have the effect which the authorities wanted to have, which is to intimidate and to frighten people who are trying to speak the truth, but at the same time I think that Julian Assange has already become the figurehead, the leader for people who are committed to the truth, who are committed to democracy. But the decision to do this to him will simply strengthen his following", Robinson opined. According to the academic, people like Mandela and Assange "have become important focal points for broader movements". "The more the authorities are trying to threaten [Assange] with jail, the stronger his following will become, the more important as a leader of that movement will he become", Robinson concluded.